Luis Barbeito is Doctor in Medicine (Universidad de la República, Uruguay). 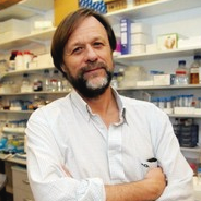 He attended postdoctoral studies in neuropharmacology in France (Chair of Neuropharmacology, Collège de France). He was a founder scientist of the Institut Pasteur de Montevideo, a leading research institution established in Uruguay since 2006 devoted to biomedical research and biotechnology. He was its Scientific Director (2006-2010) and since 2010 he was appointed Executive Director, position that he currently holds. He directs the Laboratory of Neurodegeneration in the IP Montevideo and perform research on the cellular and molecular mechanisms of brain aging and the neurodegeneration processes. He has made key contributions for the development of preventive or curative therapies for these pathologies. His laboratory works in close collaboration with researchers from several countries around the world as well as pharmaceutical companies. Luis Barbeito has published over 100 articles in international scientific journals including publications in Science and PNAS journals, has filled 2 international patent applications and has tutored dozens of PhD and MSc. students. Luis Barbeito was President of the National Council of Science and Technology (CONICYT) between 2006 and 2009, actively contributing to the Law of Science, technology and Innovation approved in 2007. He is a Researcher Level 3 of the National System of Researchers and he is a Professor of PEDECIBA (Program for the Development of Basic Sciences, UdelaR – MEC). He has received several national and international awards such as the Claude Bernard Award of the Franco-Uruguayan Association of Medicine, the Fulbright Award in Science and Technology and the Leloir Prize of the Argentinian government. He is a member of the National Academy of Science of Uruguay and of the Third Word Academy of Science (TWAS). Inhibitors of type III tyrosine kinase have demonstrated therapeutic benefit in oncologic, inflammatory and fibrotic diseases. We have previously shown evidence that post-paralysis survival of SOD1G93A rats can be significantly extended by the masitinib, a drug currently in phase 3 clinical trials for ALS. Masitinib is unique among many other ALS-developmental drugs because it exerts protection in SOD1G93A rats when treatment starts after overt paralysis onset, potentially reproducing the clinical setting in ALS patients. Masitinib targets a highly selective profile of tyrosine kinases including CSF1R, KIT, PDGF-R, Fyn and Lyn. Through inhibition of CSF1R, masitinib strongly reduces gliosis and the emergence of aberrant glial cells in the ventral horn of symptomatic SOD1G93A rats. In the fast-fatigable muscle extensor digitorum longus (EDL), post-paralysis treatment with masitinib significantly decreases c-Kit-expressing mast cells that accumulate close to denervated motor plates. Masitinib treatment starting after paralysis onset dramatically reduces the number of degranulating mast cells and delays NMJ denervation, as compared with vehicle-treated rats. In the sciatic nerve of symptomatic SOD1G93A rats, a subset of reactive Schwann cells expresses CSF1 and IL-34, which stimulate macrophage proliferation and activation through CSF1R. Additionally, a subset of invading macrophages express stem cell factor, which promotes the proliferation and differentiation of mast cell precursors through activation of c-Kit. Furthermore, a sub-set of chymase+ macrophages accumulate and pack together with neutrophils, likely exacerbating the focal nerve pathology. Treatment with masitinib for 15 days from paralysis onset, prevents the appearance of mast cell/neutrophil aggregates and reduces the number of non-phagocytic macrophages. Remarkably, the treatment also significantly decreases axonal pathology and demyelination, as compared to vehicle-treated rats. These findings further strengthen the rationale for treating ALS with tyrosine kinase inhibitors, in particular masitinib, and indicate novel pathogenic pathways in the central and peripheral nervous systems involving inflammatory cells, the emergence of which is likely associated with paralysis progression.